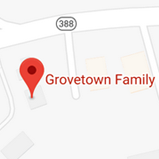 At Grovetown Family Dental, Dr. Julia N. Wheeler and our team care for patients like family. We offer patient-centered, advanced dentistry, tailored to each person’s unique needs. We work with you, to achieve the beautifully healthy smile you deserve! Our office is a safe space in which our patients relax, feeling secure, heard, and respected. We are experienced professionals; we’re also warm, personable, and thrive on the lasting relationships we build with those in our care. Using a comprehensive approach, Dr. Wheeler will design a treatment plan specifically for you. She looks at the whole of your life, seeking to improve your dental and overall wellness, oral function, and aesthetics. Her goal, and that of our team, is to deliver the smile you desire – and ensure it’s healthy and strong for a lifetime of smiles! You and your loved ones deserve dental care that’s painless, worry-free, and ensures you achieve optimal results: Grovetown Family Dental delivers that experience! Please contact our family-friendly office, in Grovetown, GA and serving Harlem, Augusta, and surrounding communities, to schedule a visit with Dr. Wheeler. She, and our team, look forward to welcoming you to our dental family!